Both have extensive wardrobes, one of which has a safe inside. The bathroom is fully tiled in Mediterranean ceramics. It has a bath with shower over, vanitory unit and mirror and toilet. The living room is comfortably furnished with two settees, pouffe, coffee table and large LCD TV with DVD player. Wireless internet access is available for your computer. The dining table seats up to 6. The kitchen is fully fitted including oven, hob, microwave, toaster, kettle, fridge/freezer and washing machine. There is all the crockery, cutlery, utensils and pans you will need. In a broom cupboard are an airing rack, ironing board and iron. Towels and linen are included for use within the apartment and separate towels are provided for pool/beach use. The large balcony is furnished with a table and 4 chairs. The balcony is linked to No 38's balcony so that the two apartments can be used as a 4-bedroom complex if required. Your apartment is on the top (2nd) floor of a modern complex. From the main windows and balcony there are uninterrupted views of Famagusta Bay and Town, the ‘panhandle’ of Cyprus and the shared pool area and sun terrace below. It is spacious, with individually controllable air conditioning in each room and fully furnished to a high standard. 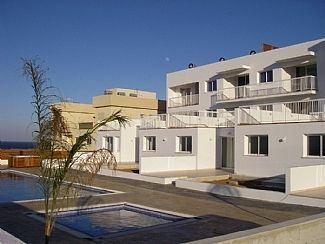 The location is within 5 mins of the sandy coves and restaurants of Kapparis and all the facilities of Paralimni. The resorts of Protaras and Aiya Napa are within 20 mins with the nature reserve of Cape Greco between them. There is allocated under-ground parking and elevator access to the apartment level. Apartments Nos. 37 & 38 are in the same ownership. They are identical in layout and furnishing. The balconies of the two apartments are linked with gate access from one to the other. With this open a larger family or group can use the two apartments as a 4-bedroom complex to sleep up to 8. Their Homeaway Property Numbers are 3362570 & 3362571 if you need to check availability of both. We are self-employed with 2 grown children and 5 grandchildren. We live on the south coast of England in Poole and like to get away when we can in the winter months to the warm, dry climate of east Cyprus. We chose Paralimni to be in a normal Cyprus town, but within minutes driving of the beaches. This way we have the best of both worlds: a quiet retreat from a hectic business schedule at home but with great views and within a short drive or 20 minutes walking of restaurants, beaches, shops and crowds when we want them. With having the two linked apartments we enjoy having friends and family to stay with us. With linked balconies, but two front doors we can each have as much or as little privacy as we like. Notes on accommodation: A welcome pack of essential provisions can be supplied at cost plus 5 euros. We recommend hiring a car and can arrange airport transfers if you wish to do this locally. Smoking is not permitted anywhere inside the apartment. The living area and each bedroom have individual air-conditioning units that you can set to your own preferences. Satellite televison reception is provided with a selection of free channels in a range of languages. Outside: Shared pool and sun terrace. Large private shaded balcony with uninterrupted views across open country to Famagusta Bay and Town and the panhandle of Cyprus. Very Roomy all Mod Cons. Superb. The Balcony has fantastic views over the deserted City of Famagusta, bring your Binoculars. A car is essential but all you need is within a 10 minutes maximum drive. Owner was very accommodating to us and we couldn't fault anything about the Accommodation. The pool was spotlessly clean. All in all fantastic value and we will definitely recommend to anyone who asks us for advice as to where to stay near Paralimni. We enjoyed our stay in the spacious and well equipped apartment. The balcony was big enough to eat meals at the table and also to sunbathe on in the afternoon with lovely views. There is easy access to the adjoining balcony for a larger group booking both properties. It was a good base for touring the local area with a hired car, went to Protarus, Agia Napa, Larnaca and many other places for both nature watching and historical interest. Lots of places to eat a short distance away also takeways which will deliver. Took a Big Red Bus tour to Famagusta in the north which was well worth doing, picks up nearby. Our first visit to Cyprus and one which we would like to repeat. Within 5 mins driving of the sandy coves and beaches of Kapparis or 20 minutes to Protaras or Agia Napa. Phoenix Court is on the northern outskirts of Paralimni, 1km from the town centre and its wide range of shops. Within 5 mins drive of restaurants of Kapparis and all the facilities of Paralimni. The resorts of Protaras and Aiya Napa are within 20 mins with the nature reserve of Cape Greco between them. Booking Notes: Prices quoted are inclusive of electricity (inc. air-conditioning), broadband access, linen and towels. A 25% non-refundable deposit is required upon booking and the final balance is due 8 weeks before start of booking and is non-refundable. A security deposit of £100 is required with the final payment. Payment can be made by cheque, bank transfer or PayPal. Changeover Day: Changeover day is flexible. Notes on prices: Prices are per apartment per week in UK Pounds. Discounts available for longer lets or for renting both apartments at the same time - please enquire.